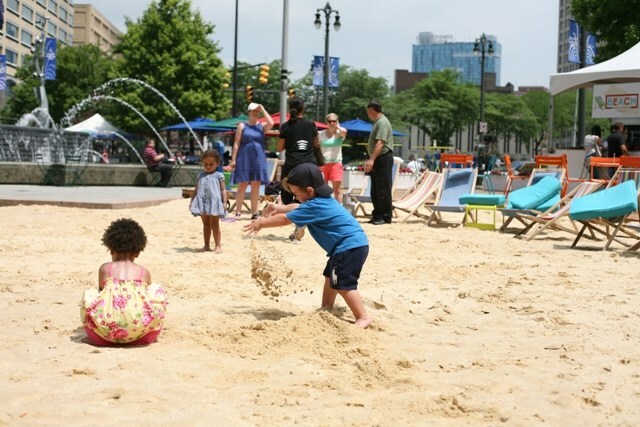 The Beach at Campus Martius Park in downtown Detroit will undergo a refresh due to a $125,000 grant awarded to the Downtown Detroit Partnership by the Southwest Airlines Foundation, an advised fund of Silicon Valley Community Foundation. New events will include beach-side beer and wine tastings and a program called Beach House: Summer Sounds from Around the World, where local DJs will play music from inside a retrofitted airstream trailer. Additional funds will be directed to support existing events such as the Friday Beach Party, which features local Caribbean and Reggae bands. Activities will also include tabletop shuffleboard, ping-pong, giant Jenga, and petanque in the southwest garden of Campus Martius Park. The Fountain Detroit will soon offer barbecue created by executive chef Jordan Hoffman of Parc, Hour Detroit’s 2018 restaurant of the year. In addition, the Downtown Detroit Partnership will launch a recycling pilot in neighboring Cadillac Square. The initiative aims to incentivize the 75 rotating Downtown Street Eats food trucks to use biodegradable materials and encourage visitors to recycle in public spaces via two kiosks, which are not funded by the grant. Each year drives more foot traffic downtown, and the amount of trash collected by the Downtown Business Improvement Zone nearly doubled from 2016-2017. The Downtown Detroit Partnership was chosen as one of five recipients across the U.S. to receive the grant as a part of the foundation’s Heart of the Community program, which provides financial and technical assistance to partners bringing new life to public space. Since its inception, the program, in partnership with the Project for Public Spaces, has awarded more than $3.6 million in grants.